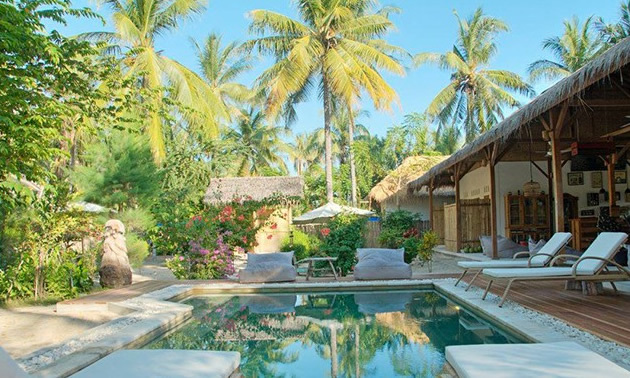 In the lush tropical jungle of Gili Trawangan in Indonesia, among the birds, cows, goats and coconut trees, you’ll find the La Cocoteraie Eco-lodge. With only eight tents, a restaurant and bar, and a swimming pool, this wonderful location offers an intimate and relaxing experience where nature is the main guest. 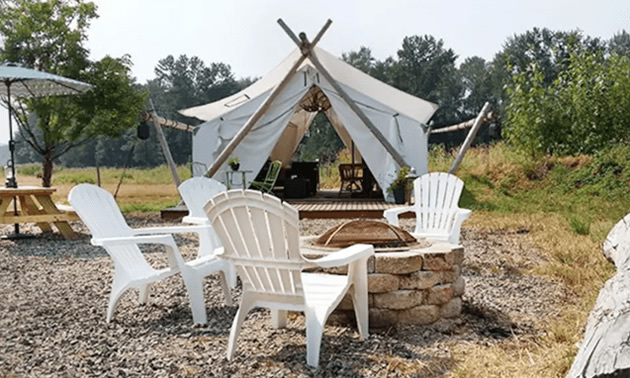 The tents are intimate and cozy and have all the comforts you’d expect from any resort, but with the peacefulness and privacy of a small glamping spot dedicated to offering you a quiet and serene atmosphere for reconnecting with nature’s essence. 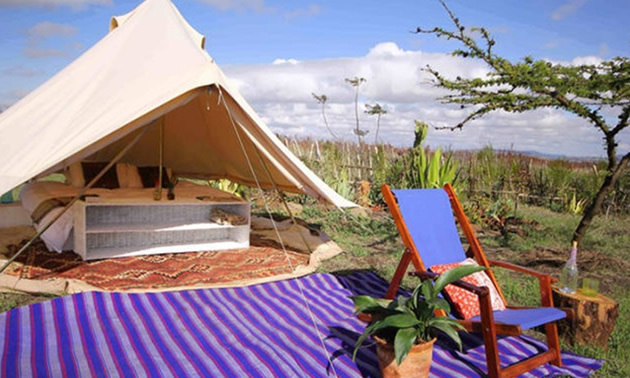 If you’ve already experienced the luxury of glamping and are looking to take it to the next level, then BANU Boutique Tent Villas is what you’re looking for. 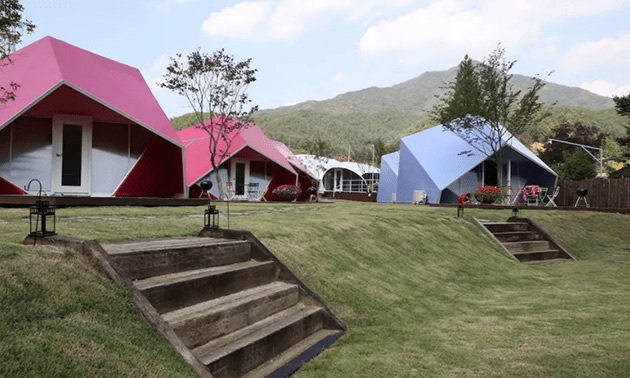 Beyond premium luxury camping, BANU offers a whole new dimension in effortless camping set among open lush green landscapes next to the banks of Noil River in Honcheon, Gangwondo, South Korea. These fully furnished duplex villas are designed by MIT and Harvard architects and have absolutely everything you would expect from such an introduction. Full kitchen, queen-sized beds, complete bathrooms, biodegradable tableware, air-conditioning and heater and heated floors make up the long list of comfortable details. We could go on and on, but the best thing to do is go there and experience for yourself. You’ll never see glamping the same way again. Surround yourself with acres of beautiful Washington nature in Falling Water Gardens just outside the city of Monroe. These tents are equipped with queen-sized beds and deluxe linens, dining tables for four, all the amenities you can need like a coffee maker, microwave, fridge, dishes, silverware, wine glasses, and more. At night turn on the LED candles for a romantic ambience. With a “Lawrence of Arabia” decorations, this experience will be an unforgettable time that will stay with you forever. 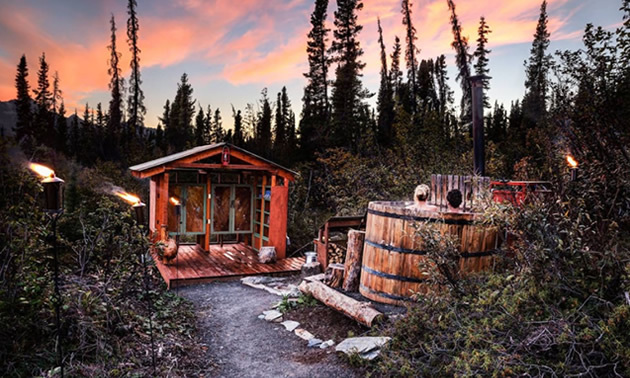 If spending the night in a cozy bed with lush linens and all the comforts of a fully-equipped tent is not enough, then relax on a spacious porch as the sky and the stars of Alaska take your breath away with their grandiosity. You might even catch the Northern Lights. Finally, if you get too cold, jump in the outdoor hot tub and warm up as the fresh air cleanses you. Another perk is the chance to take a trip out to the Matanuska Glacier and enjoy its natural magnificence first hand. 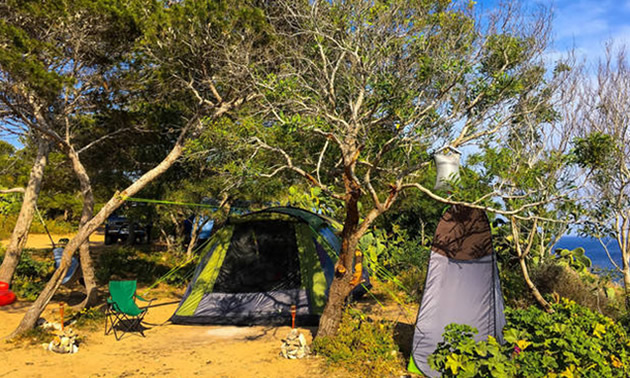 In one of the most beautiful spots in Malta, in a public camping area in Ahrax, you´ll find a service that sets up your tent and does everything you need to make your stay is comfortable and hustle-free so you can enjoy everything this spot has to offer without any worries. Wake up in the morning to birds singing and natural fresh air, have breakfast in your fully equipped tent, and take a walk among breathtaking views and nature. After about fifteen minutes arrive at a beautiful sandy beach and take a plunge into the crystal-clear waters of the Mediterranean Sea. Come back to your tent and spend a relaxing night surrounded by peace and quiet. Attention to detail and luxurious touches make this glamping site in Kenya the only proper way to enjoy its beautiful wild landscapes. Bell tents imported from the UK will keep you covered. Stay off the grid, but still get electricity and running water in the open-air shower, use your fully equipped kitchen or hire staff to cater to your needs. 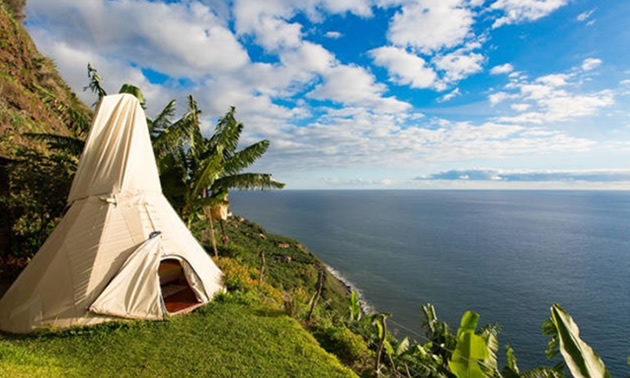 The beautiful Madeira Island off of Portugal is the perfect spot for a next-level glamping experience. The tents and cabins in this spot are fully equipped with bedrooms, bathrooms, water and electricity, terraces and porches. You can enjoy the waves on the beach worry-free. Just relax in the banana tree forest and let nature do the rest. 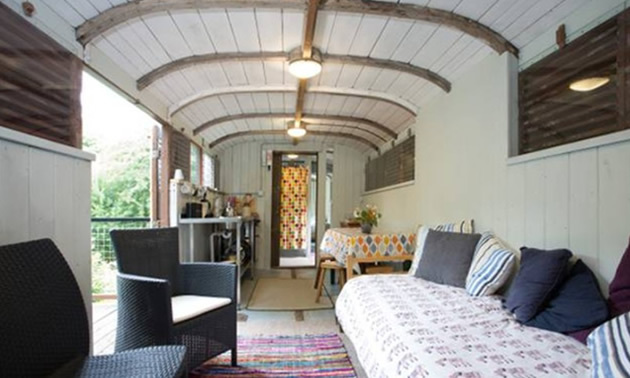 This 60-foot long modified railway carriage is the perfect glamping site for enjoying St. Austell´s beautiful natural setting, one of the most beautiful in England. The site has solar powered electricity for charging your phone and lighting. Additionally, you’ll find enough space to relax in one of the three separate bedrooms. The hot shower is a nice bonus as well. Step out onto the raised deck and grill yourself a freshly-caught fish by the fire-pit. 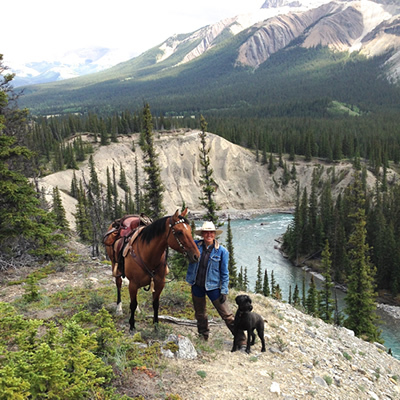 There is also plenty of space for hiking and admiring the fauna around you. 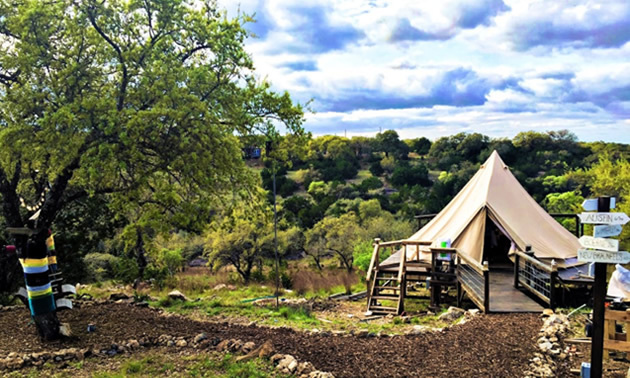 In an open stretch of land north of San Antonio, you’ll find these gorgeous Bell Tents. Equipped with air-conditioning, a fireplace, cozy blankets, a full bathroom, a hot shower, and an open deck, your only responsibility will be relaxing and enjoying this natural paradise of Texan Hill Country. Arrange for the delivery of wine, champagne, appetizers and cheese trays to make this a romantic getaway you´ll never forget. Credit: This article was originally published on AllTheRooms.com. AllTheRooms is the world’s only complete accommodation search engine, combining hotels with vacation rentals, secret deals, and all other types of accommodations. Their misadventures include blown tires, getting stuck partway on a Mississippi ferry and crushing a tailpipe. 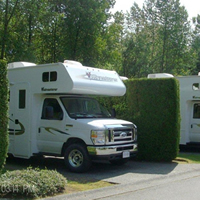 But these fulltimers love their nomadic lifestyle aboard a 40-foot, two-level motorhome.